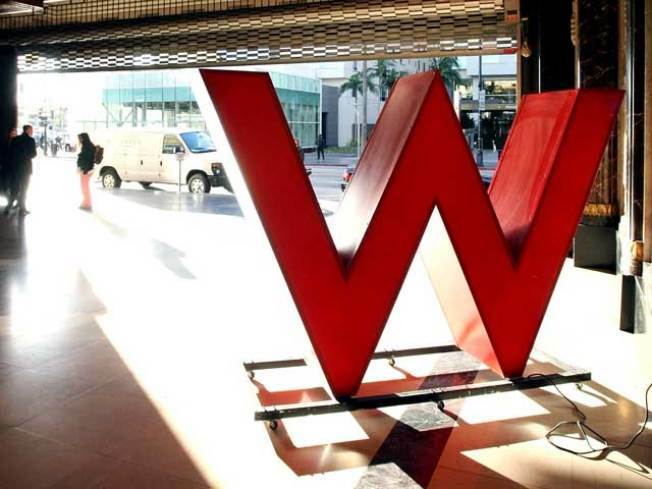 Hollywood has a new star, and the spotlight is on just a single letter -- "W."
The new W Hotel opened Friday on the famous corner of Hollywood and Vine. Everyone has to walk on a red carpet to get inside. "This is Hollywood's second Golden Age," said L.A. City Councilman Eric Garcetti. The $600 million development is a mix of hotel suites, apartments clubs, restaurants and shops. The state-of-the-art rooms are energy efficient. The W Hotel opens at Hollywood and Vine. The W Hotel provides hundreds of much need jobs for a city facing a financial crisis. A metro line commuter train runs directly below the hotel. That'll make it a convenient tourist stop. The hotel, plans for which were drafted in the 1990s, includes 143 residences priced at $500,000 to $7 million. Gatehouse Capital is the project developer. "Today the economy is less robust than it was three years ago," Gatehouse CEO Marty Collins told the Wall Street Journal. "But, relative to what it was 12 years ago when I started (the W project), this neighborhood has exploded." If you're thinking about a Valentine's Day weekend at the hotel, know this: Using the online reservation form, a Saturday stay for two adults will cost between $309 and $439. That high-end room's description: "King Bed, Marvelous Suite Non-smking, W Signature Bed, Plasma Tv 50 Inch, Wi-fi Internet For A Fee, I Pod Docking Station."